NSR Weighs Jumping On The UltraHD Bandwagon + Is It Worth It For The ROI? While UltraHD seems to be the natural next step up from HD, there are many questions not the least of which is the question of the ROI. An example of cautiousness is UltraHD is popular with sporting events yet NSR reports that the 2016 Olympics in Rio de Janeiro will largely be filmed in regular HD. UltraHD has been trumpeted by many as the future of television, with consumer interest starting to pick up speed and penetration of UltraHD compatible TV sets increasing in leaps and bounds. Jumping on the UltraHD bandwagon in many cases is necessary to stay one step ahead of the competition, most notably OTT products and services. However, there there has been significantly less discussion on the upcoming revenue impact on UltraHD broadcast—despite this discussion being critical to determining UltraHD’s ROI. In NSR’s recently released UltraHD via Satellite, 3rd Edition, by 2025 NSR forecasts approximately 300 UltraHD channels on DTH platforms using leased capacity. This is in addition to satellites carrying UltraHD channels being distributed to Cable and IPTV platforms, as well as dedicated DTH platforms such as Dish and DirecTV in the USA, which maintain their own dedicated satellites. Of these ~300 channels, only some will have a direct revenue impact to their respective DTH platforms, at least in the short term, and herein lies the ROI conundrum for UltraHD. The main consideration of course, is “will UltraHD boost the bottom line?” The answer to this is “Yes, but success is not universal and it depends on the implementation.” Netflix has had limited success in convincing customers to upgrade to the “premium plan” that includes UltraHD content amongst other sweeteners. However, subscribers of linear TV platforms in developed regions have shown time and time again they are willing to pay extra for content deemed valuable, whether it be HD content, or specific sports events or movies. NSR expects that for the next 4 years, the majority of DTH platforms with UltraHD content will include 4K channels in their top tier packages. This effect is twofold: demonstrating UltraHD content to new buyers of 4K TVs who wouldn’t otherwise see the benefit of such content, and getting subscribers familiar with UltraHD content, by in effect making HD content look somewhat dated. By around the end of the decade, NSR expects many DTH and Pay TV platforms to begin charging additional fees to access UltraHD, thereby creating an improving revenue stream through increased ARPUs from both Ultra Premium subscribers and those on more basic packages. Sports content and movies, the staple drivers of pay TV subscriptions, remain crucial for UltraHD. World Cup and Olympic games were large drivers of HD content, and will be for UltraHD content as well. However, in the 2016 Olympics in Rio de Janeiro, will largely be filmed in regular HD, with some exceptions, so a sudden spike in 4K TV uptake is not expected until much later. Partnerships with OTT platforms as well as native OTT services remain crucial as well, and complement linear UltraHD services. More than 25 pay TV platforms have partnered with Netflix, for example, to provide OTT content direct to the set top box. While there are very limited additional revenues for pay TV platforms though these partnerships, it is used as a critical retention strategy for consumers. OTT platforms have had 4K content libraries since April 2014, so linear TV platforms have some catching up to do. This is in fact the opposite scenario compared to the introduction of HD; platforms don’t have the luxury of taking a ‘wait and see’ approach. For some early UltraHD entrants, such as KT SkyLife, being an early adopter may bring in additional revenue streams in the short to medium term while the UltraHD transition process remains underway. KT SkyLife has significant room to grow for UltraHD subscriber numbers, and it would not be unrealistic for over half of KT SkyLife’s subscribers to have access to the increasing levels of bouquet channels. This should lead to significant transitions to higher ARPU packages due to high 4K TV penetration rates and the ‘network effect’ of seeing 4K TVs commonplace around the country. But Korea perhaps stands as an outlier in assessing UHD adoption given the tech savvy nature of Korean consumers. Only time will tell. 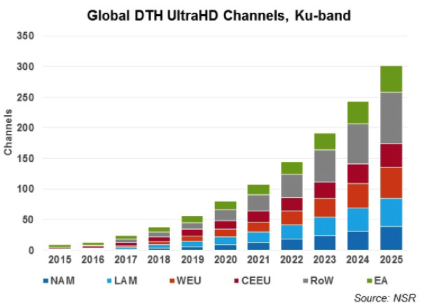 Higher capacity demand for high bandwidth UltraHD channels is a clear revenue boost for satellite operators; however, the short term ROI for UltraHD on DTH platforms is less certain. Costs for acquiring UltraHD content will be greater than SD or HD content, resulting in net losses for the first few years of UltraHD operation. After 2020, NSR expects a direct positive revenue impact from the introduction of UltraHD linear TV channels on pay TV platforms globally. Subscribers from the large installed base of 4K TVs from 2020 onwards will more than offset content acquisition costs after a couple of years, with ARPUs expected to be approximately 10 percent higher than those of the current high end package ARPUs in most regions. While ROI is expected to be relatively modest long term, the greater risk for a DTH platform is to fall behind in innovation compared to competitors, entering a vicious cycle of cord cutting and decreasing ARPUs—and UltraHD is one component to arrest this decline and provide stable revenues long term. So rather than thinking in purely ROI terms, UltraHD may be just a necessary pill multi-channel operators need to swallow, especially in the near term, to stay competitive.